There were 750,000 Girl Guides in the UK when war broke out, which meant that there was a huge pool of skilled girls and young women willing to contribute to the war effort. Guides were earning badges as proficient electricians, mechanics, first-aiders, and signallers. The telegraphist badge required them to construct their own wireless receiver and send messages in Morse code at a speed of 30 letters per minute. They also distributed gas masks, whitewashed kerbs so people could find their way in a blackout, kept up morale in bomb shelters with songs, and raised funds to buy ambulances and lifeboats. 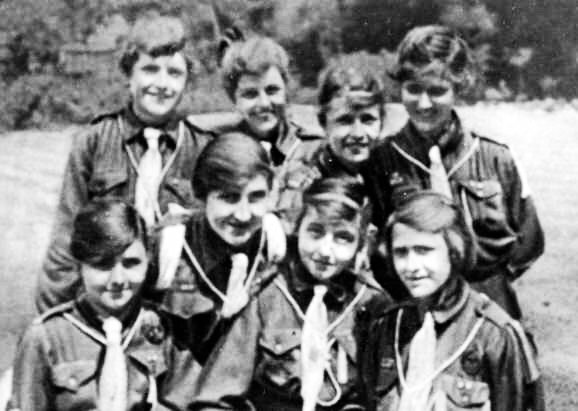 Girl Guide companies everywhere were involved in national or local activities to help the war effort. Close to RAF Kenley, Girl Guides raised money for the Spitfire Fund, laying a mile of pennies along the main road between Coulsdon and Purley. Those not old enough to enlist in forces such as the WAAF, turned up at hospitals, nurseries and evacuation centres – and the matrons could see from the badges sewn on their sleeves of their uniforms, that Good Deeds were imminent and that a sensible, well-ordered girl was ready to proffer calm, organised assistance with skill such as first-aid, fire-fighter, child care, or entertainer. At the Lord Mayor’s show in London in 1942, Winston Churchill took off his hat in salute as the Guides marched past.